Contract collection of modular elements with an elegant and refined disegn, that can combined in many different ways. The model is characterized by the entirely handmade quilting and is available in fabric, leather and artificial leather. The Gordon collection offers a wide range of sofas, armchairs, modular elements, corner elements, longchairs and sofabeds, thus satisfying any possible planning need in a modern living room. Gordon can be covered in fabric, leather and artificial leather. The great attention to details and finishes is even more enhanced in the version with quilted seat and back cushions. The high seating comfort is ensured by the use of highest quality materials. Gordon is also available in the Gordon Move version, consisting of a series of sofas and longchairs equipped with function in the backrest that enables to adjust and reduce the depth of the seat. The Jack collection offers a wide range of sofas, armchairs, modular elements, corner elements, longchairs and sofabeds, that can be manufactured with three different depths: 100 cm, 110 cm and 120 cm, thus satisfying any possible planning need in a modern living room. The high seating comfort is ensured by the use of highest quality materials. Jack is also available in the Jack Move version, consisting of a series of sofas and longchairs equipped with function in the backrest that enables to adjust and reduce the depth of the seat. 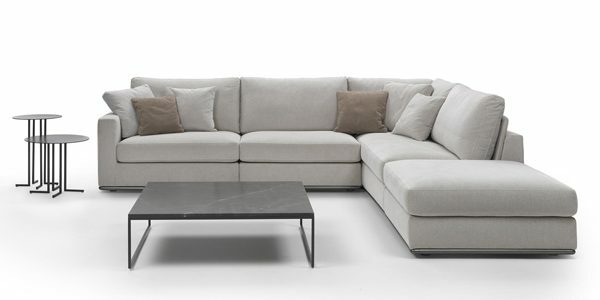 Matheus offers a programme of sofas, longchairs and modular elements with modern and elegant lines. It can be combined in many different ways, in order to fit into any modern living room. Matheus is a very comfortable sofa and is charachterized by a great attention to the used materials and a constant pursuit of perfection in every single detail. Matheus is available in fabric, leather or artificial leather. Collection of sofas, armchairs and modular elements with a refined design. The distinguishing features of this model are the wide armrest and the slender metal base. Available in fabric, leather or artificial leather, New York is a contract model conceived for the furnishing of hotel lobbies and management offices, but that is also perfect for a residential use. Collection of sofas and modular elements that can satisfy any planning need in terms of size and finishes, characterized by the particular backrest. River is available also as curved sofa and offers round pouffes in different sizes that can serve as decorative element or as additional seat. Available in fabric, leather or artificial leather. The Oliver collection consists of sofas, armchairs, modular and corner elements and longchairs with contemporary lines, charachterized by a high seating comfort and a great attention to details. Covers can be in fabric, leather or artificial leather. Oliver is a very versatile product that can be combined in many different ways and offers lots of opportunities to customize your sofa, such as the version without panel behind the back cushion or the version with wider armrest, or the more classic option with flounce. Oliver is the ideal model for any kind of modern living room.